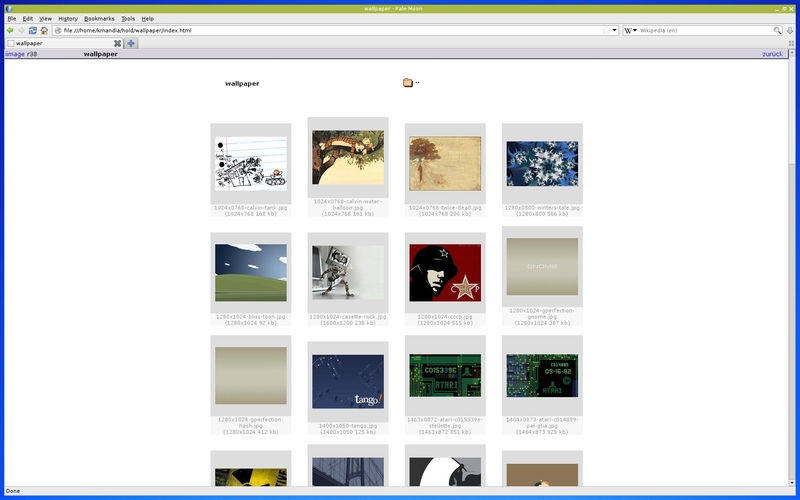 A long time ago we looked at album, which ran down a directory of images and created a clickable album as an HTML page. Here’s one that does much the same thing: iimage. iimage is just a bash script that relies on imagemagick‘s convert to create thumbnails, and adds the remaining touches to a folder called .tmp. It does not alter or move your original files, but all my attempts (and the instructions) suggest you have to call the script from the folder where your images lie. Let me know if you find a way around that. iimage’s output page is very clean and modest, so if you’re looking for something a little more outlandish, you might have some HTML editing in your future. iimage is nothing if not exceptionally neat, with all its product files arranged and ordered. I like that a lot. Judging by the help flags, iimage can recurse through folders, but I didn’t try that, so I don’t know if recursed directories produce linked pages in the final product. iimage can also update files it has created previously, so you should be able to simply add or remove images to the folder, and generate fresh files without rebuilding everything from scratch. iimage also will apparently generate an AUTORUN.INF file, which I believe would trigger a full desktop environment to open the index, if you were to burn all of this to a CD and spin it up. I might be wrong on that, but it’s an excellent addition if it’s true. I see that the date on the most recent version is 2009, but I had no problems aside from dropping the script into the right folder to get everything built. I don’t expect there will be many inconsistencies or technical issues, at least until imagemagick or one of the underlying programs shifts gears. This entry was posted in Linux and tagged create, index, manager, photo, picture, site, web on 2014/11/13 by K.Mandla. I do my best to tinker with all the local mail tools that I collect, even when some of them are well beyond my reach. 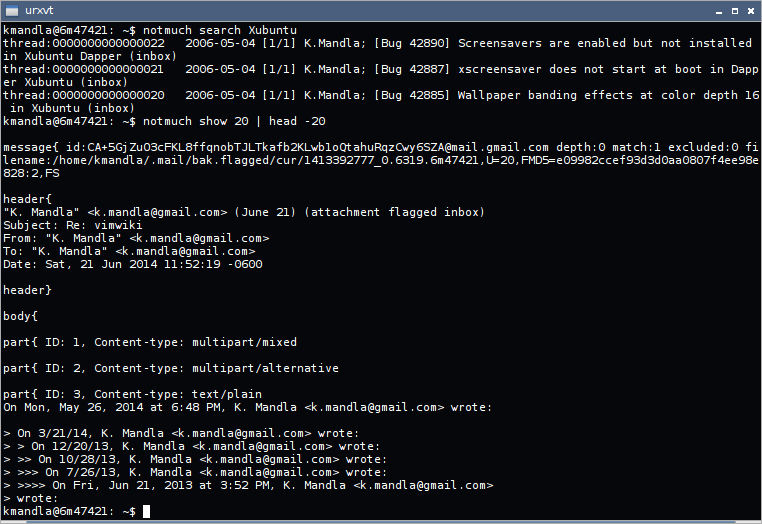 notmuch is a mail indexer, that supposedly is extensible to a practical mail reader, with the help of some outside applications. 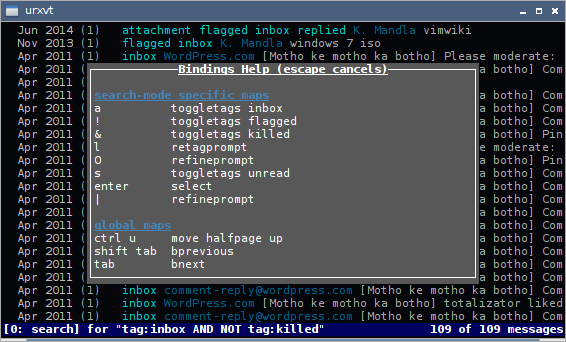 If you keep a local mail folder but need something to search and sort, notmuch might work well for you. I did that little bit with the help of offlineimap and one Google Mail account, and it didn’t take much more effort to get notmuch working. 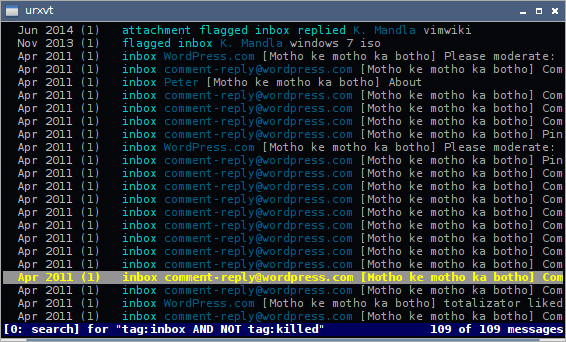 On its first run, notmuch gave me an interactive configuration wizard, and in the space of a minute, I was picking through my .mail folder. notmuch has only a few commands — like search and show above — that return mail results, and from there you can manage them as you need to. I see that there are also apparently provisions for tagging messages, and dumping and restoring, a la an e-mail backup. notmuch is another tool that, by itself, is not much. 😀 It will require something to fetch the mail, and probably you’ll want to either incorporate it into another program as a mail reader — I see that both emacs and vim are possibilities, as well as the classic mutt — and there’s still the task of replying to mail before notmuch becomes a full e-mail suite. That’s a little more than I have time for, and to be honest, if you’re the kind of person who manages their e-mail at the local level, it’s probably something you’re better at setting up than I am. No offense taken. This entry was posted in Linux and tagged e-mail, index, mail, search on 2014/10/15 by K.Mandla. Weakly on my part, not the application’s part. After some real-life intrusions yesterday that completely derailed any plans I had, and after sifting through the first dozen programs on my list and finding a lot of no-shows, I’m going to get the ball rolling with mairix, because I like the looks of it. One of my biggest shortcomings over the past year has been the inability to show a lot of clever mail tools, because I rely on web-based services and don’t run things locally. I don’t think that’s terribly unusual, but it does mean that things like mairix are more hassle to set up than it’s worth — just to write four paragraphs and snap a screenshot. It was exceptionally easy to set up though, and while I couldn’t do much but skim through a leftover message or two abandoned in the wake of my last session of re-alpine, mairix complied willingly. mairix by all accounts should give you quick and painless searching of your locally stored mail, whether it’s maildir, MH or mbox format. And what I see on the web site looks promising. That, plus the fact that it’s in Arch’s community repo, makes me a little more confident in pushing this to the forefront of the M section. 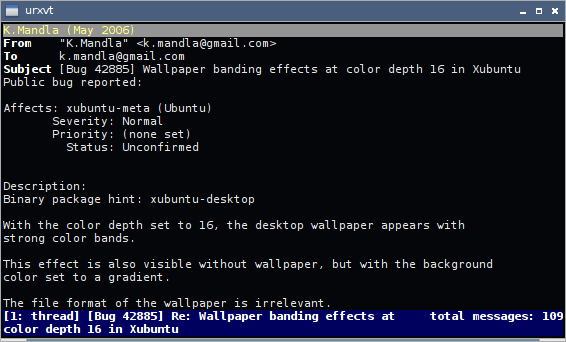 This entry was posted in Linux and tagged index, mail, search on 2014/01/03 by K.Mandla.